We can map it, weigh it and simulate it, yet we still have no idea what it is. 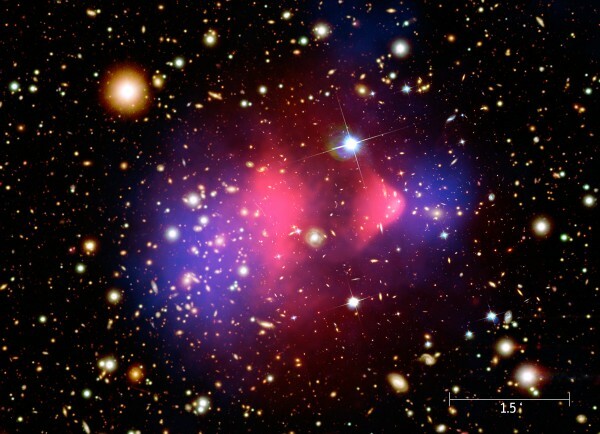 But dark matter is coming into the spotlight as never before. Astronomers now know that for every grams worth of atoms in the universe, there are at least five times more of a new, invisible matter neither shining or blocking light. In 1978, Vera Rubin and Kent Ford discovered that stars in nearby galaxies were not moving as expected. Stars far from the centre of a galaxy – where all the light (and hence mass) was concentrated – were moving far too quickly for the gravity of all the visible matter to hold onto them. Such observations and simulations have lead to the staggering realisation that the visible matter in our universe is the tip of the iceberg making up just 15.7% of all the mass. 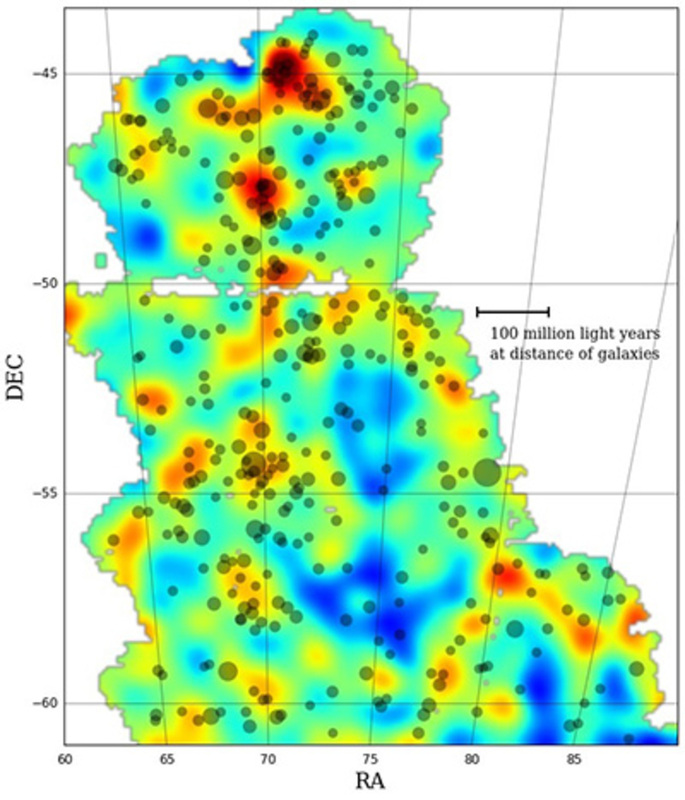 Dark Matter Map in colour with red (blue) regions representing high (low) concentrations of dark matter. The dots are clusters of galaxies found by the DES survey (the greater the cluster mass, the larger the dot). 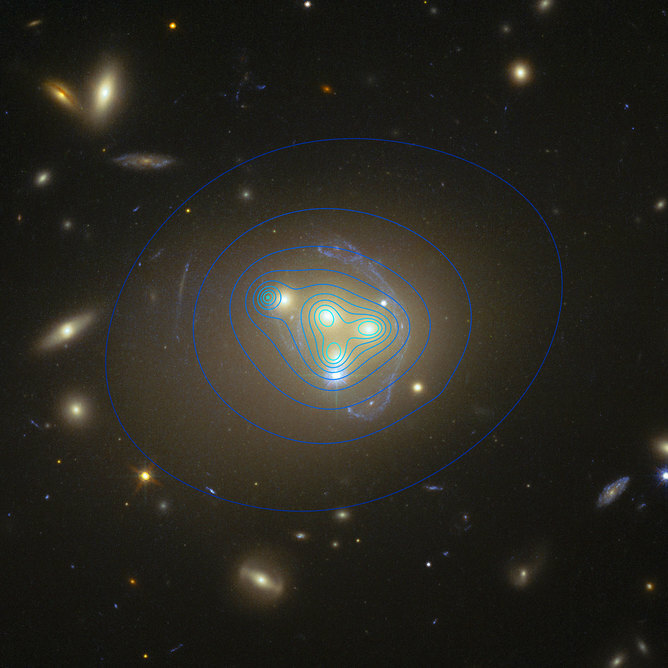 Four giant elliptical galaxies lie at the heart of a cluster with dark matter mass indicated by contours. The dark matter appears to lag behind the stars in some cases suggesting they are experiencing a ‘head wind’ as they try to push through the larger halo of dark matter. Between these two lower and upper bounds lie a lot of potential candidates but these two results suggest astronomers may finally be honing in on the elusive dark matter particle – although uniquely confirming the exact candidate will require finding it in a lab on Earth.